The frontage of this building, now home to the Fisherman’s Chip Shop, is deceptive! In 2016 renovation work inside revealed a wall that is centuries old. 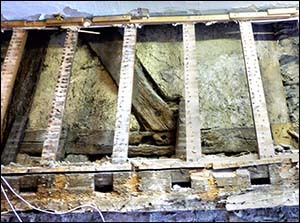 The picture here, by kind permission of Ray Castle, shows part of the wall’s timber frame (behind the vertical strips). The wall was part of a wattle and daub construction, as used on Aberconwy House on the other side of Castle Street. The wall is in the right-hand section of the building (now the dining area). It was covered over again, after an archaeological survey. The building had become the Eagles Inn by the 1860s. Previously there was a pub of this name nearby, on the corner of High Street and Berry Street. In 1882 it was recorded that Humphrey Williams, landlord of the Eagles, kept cows in a “cow-house” at the back of the premises. He was sexton (person in charge of property maintenance) at St Benedict’s Church in Gyffin. A later landlord, Thomas Jones, had a pigsty behind the Eagles by 1889. In 1894 the local Sanitary Inspector reported that the sty was kept “quite clean”. The pub closed c.1900 and the premises were renamed “Eagles Buildings” – which you can see inscribed on the frontage. It was later divided into two properties, numbers 3 and 5 Castle Street. Number 5 was known as Windsor House. Number 3 was the JT Jones butcher’s shop from 1901 to 1969. Joseph T Jones applied to operate a slaughterhouse in the backyard in 1901. In 1983 the Nolan family opened a café in number 3 for fishermen to relax after returning to Conwy quay with their catch. The business evolved to become a fish and chip shop, still run by members of the family. In 2016 it expanded into Windsor House, which was latterly an ice cream shop.